The Law Of Direct Democracy is the first casebook on direct democracy. This book uses state and federal judicial opinions, the text of ballot initiatives, statutes and constitutional provisions to compare and contrast the various state laws that govern the ballot initiative, the referendum and the recall. This book also contemplates the role of interest groups, voters, courts and elected officials and examines their ability to utilize, influence and limit the initiative process. It provides students and instructors both the information they need to learn the law of direct democracy and the tools to pursue further inquiry on discrete topics of interest. This book is the most comprehensive reference guide to more than 200 years of experience with the initiative and referendum process in Europe. With the European Union enlarging with ten new countries and the continent heading to its first Europe-wide referendum, the book offers background, facts, and analysis from more than 35 countries that will help the reader understand these important and emerging events. The volume also explores and describes criteria and requirements for a working I&R process at all political levels. Direct democracy is alive and well in the United States. Citizens are increasingly using initiatives and referendums to take the law into their own hands, overriding their elected officials to set tax, expenditure, and social policies. John G. Matsusaka's For the Many or the Few provides the first even-handed and historically based treatment of the subject. Giving Voters a Voice studies the origins of direct legislation, one of the most important political reforms enacted during the Progressive Era. Steven L. Piott begins with the source of the idea in the United States and proceeds to the earliest efforts aimed at generating a national movement to expand the parameters of popular democracy in the 1890s. He then broadens his examination to include the unique ways in which twenty-two states came to enact legislation allowing for the statewide initiative and referendum between 1898 and 1918. No other book has ever provided such a complete and comprehensive history of the initiative and referendum process in the U.S. Waters provides such information as the definitions of initiative and referendum; the roots of the initiative and referendum movement; the history of how the process has been utilized; regulations of the initiative process in each state; legislative attempts to regulate the process; and the role of the judiciary. The book also includes a series of essays by leading scholars and activists about the reforms brought about through the initiative process, and a brief discussion on the future of the initiative process through the eyes of activists and elected officials. 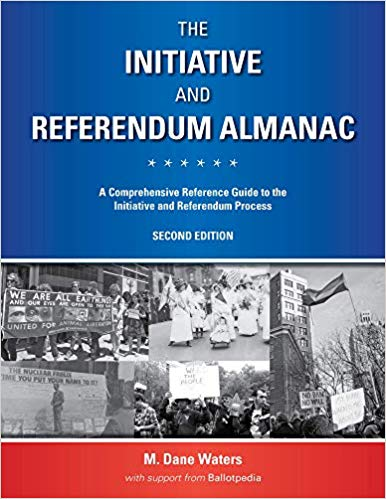 A complete listing of all relevant laws associated with utilizing the initiative and referendum process in each state, as well as a checklist of the major steps of which initiative proponents should be aware, are also included in the almanac. The appendix contains a complete listing of every statewide initiative that has appeared on the ballot since 1904; a complete listing of all the popular and legislative referenda that have appeared on the ballot since 1998; as well as other charts and graphs tracking the usage of the process since its adoption in 1898. "Complete, thorough and well-written. As a state legislator on the front lines of policy development, the Initiative and Referendum Almanac is my go-to guide for information on I&R. An invaluable source of background whether you are a first time student or a seasoned I&R expert and a must-have if you seek to intelligently debate the subject." Democracy means the rule of the people. Yet in all countries, the role of the citizen is limited to periodic general elections and occasional referendums - especially in Britain where the doctrine of 'Parliamentary sovereignty' was until recently an article of faith. However, referendums are becoming an important feature of Western democracy. Citizens are increasingly being called upon to decide complex political issues by the very same people they elected to make those decisions. This study offers the first comparative assessment of the referendum, looking at its development in Britain, Europe and the United States. It is becoming common in many states: citizens seizing the opportunity to reclaim government from politicians by signing a petition to put an initiative on the ballot and then voting on it. During the past decade alone, Americans voted on nearly 500 statewide initiatives. Particularly in the West, direct legislation increasingly defines and dominates the political agenda. Although this may appear to be democracy in action, Richard Ellis warns us that the initiative process may be putting democracy at risk. In Democratic Delusions he offers a critical analysis of the statewide initiative process in the United States, challenging readers to look beyond populist rhetoric and face political reality. This book looks at the ways in which Madison's ideas might instruct and inform our era. Alex Kozinski, Stephen Engel, and Roger Pilon call for a return to Madison's belief that the powers of the federal government are limited to those granted in the Constitution. The historians Joyce Malcolm and Robert McDonald examine the ways in which Madison was unique and the differences he had with Jefferson. Tom G. Palmer, Jacob Levy, and John Samples reflect on Madison's implications for contemporary multiculturalism and the practice of direct democracy. Walter Berns and Michael Hayes hold up his strict separation of politics and religion for both praise and blame. The book closes with essays by James Dorn and John Tomasi, which suggest that developing nations and the larger world would do well to follow Madison's concern for limited government and human rights. The book shows why open, democratized financial markets and, eventually, institutions of direct democracy - referenda and initiatives - are the institutions that can prevent people, businesses and countries to persist too long pursuing mistaken ideas, strategies and policies, and thus for them to prosper. Countries dig themselves into a deep hole when they do not let these institutions to emerge. Where once most state laws were passed by legislatures, now voters in half the states and hundreds of cities decide directly on such explosive issues as drugs, affirmative action, casino gambling, assisted suicide, and human rights. Ostensibly driven by public opinion, the initiative process is far too often manipulated by moneyed interests, often funded by out-of-state millionaires pursuing their own agendas. In this highly controversial book, David Broder, the "dean of American political journalism" (Brill's Content), explains how a movement that started with Proposition 13 in California is now a multimillion-dollar business in which lawyers, campaign consultants, signature gatherers, and advertising agencies sell their expertise to interest groups with private agendas. Since 1990, the use of the initiative and referendum (I&R) has grown substantially in the United States and around the world, leading to a flood of new regulations. These regulations have generated many questions that have so far remained unanswered or been discussed only in the journals of specialized journals. Thus it has been difficult for practitioners and citizens to get the information they need to understand the regulations and their wider implications. There are legal questions about signature gathering, limits on campaign spending, etc. ; political questions about implementing the relevant statutes; philosophical questions about equality and about freedom of expression. The book comprehensively address these issues from the viewpoint of leading scholars, opinion leaders, journalists, elected officials, activist and attorneys. Do small but wealthy interest groups influence referendums, ballot initiatives, and other forms of direct legislation at the expense of the broader public interest? Many observers argue that they do, often lamenting that direct legislation has, paradoxically, been captured by the very same wealthy interests whose power it was designed to curb. Elisabeth Gerber, however, challenges that argument. In this first systematic study of how money and interest group power actually affect direct legislation, she reveals that big spending does not necessarily mean big influence. Early in the twentieth century, many American states began experimenting with direct democracy. Direct democracy—primarily the initiative device—allows groups to place directly before voters laws affecting taxation, spending, term limits, school choice, gay rights, immigration, and numerous other state issues. Ballot initiatives were expected to allow citizens the option of getting around legislators who were seen as beholden to wealthy interests; early defenders of the process argued it would make state politics more responsive to the public will, and more responsible. Citizens as Legislators examines direct democracy in America at the end of the twentieth century to see if it has lived up to these expectations. Referenda on important public policy questions have come to play a central role in policy making in many states. As cynicism about government has increased, many have sought to take policy questions out of the hands of elected officials and put the questions directly before the voters for decision. And yet many are skeptical about the ability of voters to make intelligent decisions about complex policy issues. Shaun Bowler and Todd Donovan present a searching and original examination of how voters make decisions in direct referenda. The authors ask if voters have some information about the issue easily at their disposal and if they make choices that seem sensible given their interests and the information they have. Looking at the way voters respond to different kinds of questions, the authors suggest that while direct democracy has its failings, the flaws do not necessarily lie with citizens being "duped" or with voters approving propositions they do not want or do not understand at some basic level. Daniel A. Smith exposes the truth about the American tax revolt. Contrary to conventional wisdom, recent ballot initiatives to limit state taxes have not been the result of a groundswell of public outrage; rather, they have been carefully orchestrated from the top down by professional tax crusaders: political entrepreneurs with their own mission. After decades of disuse, a startling upsurge in the use of the Initiative and Referendum—law-making by citizen petition and popular vote—occurred in the 1970s and 1980s. In Citizen Lawmakers, David Schmidt tells the stories of the individual activists, such as Howard Jarvis and Ed Koupal, and the political groups that made this happen. While other studies have analyzed the statistics of the ballot initiative revolution, this book provides the personal, political, and historical contexts vital to understanding the causes and the tremendous impact of the trend toward ballot-box lawmaking over the last two decades. Schmidt demonstrates how "ordinary individuals, even in this age of monstrous bureaucracies and larger-than-life celebrities, can, and do, change this nation’s laws to make government more accountable."